Kenya: Kenya's dilemma in Somalia: to withdraw or not to withdraw? 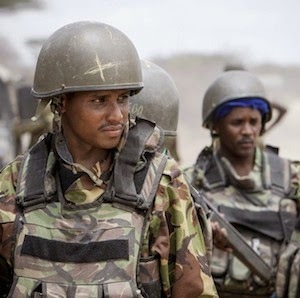 It has been almost three years since Kenyan troops were deployed neighbouring Somalia to create a security buffer zone on the Somali side of the border. The main aim at the time was to reduce growing insecurity in Kenya, which affected the country’s economy and the tourism industry especially. Since the deployment and the subsequent integration of Kenyan troops into the African Union Mission in Somalia (AMISOM), however, the goal of reducing insecurity is yet to be realised. Instead, insecurity that is attributed to the very presence of Kenyan troops in Somalia has continued to rise. The recent attacks on 16 June in Mpeketoni, Lamu County, in which more than 60 people died is yet another reminder of the increasing number of terrorist incidents that have taken place since Kenya’s deployment in Somalia. Despite the ongoing debate between government and opposition groups about the cause and perpetrators of the Mpeketoni attacks, Kenya’s presence in Somalia remains an important variable. Prior to the Mpeketoni attacks, the dilemma of dealing with Kenya’s presence in Somalia was firmly under discussion in many policy circles. One school of thought holds that Kenya should withdraw, while another argues otherwise. Some opposition groups, including the Coalition for Reforms and Democracy (CORD) and its leader, Raila Odinga, reason that Kenya’s presence in Somalia has brought insecurity. Kenya should therefore withdraw. According to this argument, radical Somali Islamists will have no reason to keep targeting Kenya once the country’s troops cease operations in Somalia. Supporters of Kenya’s continued presence in Somalia, including Deputy President William Ruto, maintain that withdrawing would mean succumbing to the demands of Islamist militant group, al-Shabaab, and expressly conceding defeat to terrorists. If Kenya’s presence in Somalia were as irrelevant as al-Shabaab would have the world believe, the group would have ignored their presence rather than insisting that the Kenya Defence Forces (KDF) withdraw. This second school of thought therefore believes that KDF’s presence in Somalia has contributed to the strides made in the stabilisation of Somalia and the successes of AMISOM; hence the pressure for them to withdraw. The country therefore finds itself in a catch-22 situation: to withdraw or not to withdraw, each of which poses enormous implications for the security of Kenyans, as well as the future and stability of the country. The position of the government of Kenya is unequivocally not to withdraw, at least for the foreseeable future. Apart from the combat fatalities that will come with the prolonged exposure of Kenyan troops to battlefield conditions, a non-withdrawal policy implies that the insecurity trends might continue to rise – unless drastic measures are instituted to mitigate the threat of radical elements in the country. Rising insecurity would, in turn, have disastrous repercussions on foreign direct investment, investor confidence, Kenya’s vibrant tourism sector and the associated political costs and pressure from citizens. Already the Mpeketoni attacks, for instance, created political damage following blame shifting between the government and opposition groups regarding who is responsible for the incidents. While opposition groups are trying to harvest political capital from these events, the government has also been quick in blaming political rivals for fomenting trouble to make the country ungovernable, and paint the Kenyatta administration as a failure in the eyes of citizens. At the heart of the blame shifting is the crumbling of unity of purpose and the politicisation of efforts, with dire implications on domestic attempts to address insecurity. Citizens are increasingly fed up with the rising insecurity without clear hopes or indications of improvements in the near future. While President Uhuru Kenyatta's administration grapples with the International Criminal Court question, the government’s worse nightmare will be to have a hugely disgruntled domestic constituency. On the other hand, if Kenya were to succumb to the pressure to withdraw, this would also come with costs. Apart from adding itself to the list of countries that have burnt their fingers in Somalia, a knee-jerk withdrawal from Somalia without a proper exit strategy would be problematic in a number of ways. First, it would reinforce the belief among some Somalis that Kenya’s incursion was fuelled by selfish interests, rather than wanting to assist in creating peace and stability for Somalia and the region at large. Secondly, it would imply conceding defeat to al-Shabaab, and would thereby give the al-Qaeda-affiliated group a reason to cause greater havoc in other countries that are currently at the frontline in the search for peace in Somalia. Thirdly, the suspicion that Kenya’s response was more of a rash response than a planned, strategic move will be confirmed for the many who warned against the incursion. Additionally, Kenya’s withdrawal from Somalia would have negative implications for the country’s strategic interests in the region and its efforts to position itself as an indispensable partner in the region’s security matrix. The country cannot afford to be absent in a context where Burundi and Uganda are clearly playing important roles in the quest for peace. Such an absence would directly erode its influence, soft power and political clout in the keen contest for regional leadership. If Kenya were to withdraw, it would not be the first to have done so. American troops withdrew in 1993 after casualties; and Ethiopian troops withdrew in 2009. The aftermath of the 2009 Ethiopian withdrawal, however, created a security vacuum, which was readily exploited by al-Shabaab. A KDF withdrawal, unless immediately replaced with another capable actor in AMISOM’s sector II, would therefore similarly be an invitation for the return of al-Shabaab and the loss of liberated areas currently controlled by Kenya. Moreover, Kenya seems to have crossed the Rubicon with its deployment into Somalia and certain choices in Kismayo – and so, even if the KDF were to withdraw, there is no proof that al-Shabaab would cease its fire against Kenya. There is every indication that the radicalisation resulting from Kenya’s presence in Somalia will persist until contained. The option of withdrawal is therefore not as easy as opposition groups make it appear, neither is non-withdrawal as cost-free and simple as pro-government communicators present it. Either way, Kenya's best options for addressing rising insecurity depends on unity of purpose among its political leadership and citizens in their commitment to the national course, rather than parochial political and ethnic interests. Politicising security issues, as had happened after the Mpeketoni attacks, is counter-productive to collective action and building political consensus for addressing insecurity. It is also important that Kenya does not blame all that happens on its territory on Somalia. Despite al-Shabaab’s influence, it is debatable whether al-Shabaab directly planned and executed all the attacks perpetrated in Kenya in their name. There is a case to be made about the challenge within Kenya itself. Kenya’s greatest vulnerability to the rising insecurity is as much a problem with internal weaknesses, fault lines at the heart of the capacity of the state, social tension and citizens’ disengagement from the state. The threat of al-Shabaab, in most cases, is mostly in its exploitation of these vulnerabilities that require urgent attention domestically.